Cyclosporiasis is an intestinal illness caused by the microscopic parasite Cyclospora cayetanensis. Cyclospora cayetanensis is a parasite composed of one cell, too small to be seen without a microscope. People become infected by consuming food or water contaminated with the Cyclospora parasite. Cyclospora is spread by people ingesting something – such as food or water – that was contaminated with feces (stool). Cyclospora needs time (days to weeks) after being passed in a bowel movement to become infectious for another person. Therefore, it is unlikely that Cyclospora is passed directly from one person to another. Who is at risk for Cyclospora infection? In the United States, foodborne outbreaks of cyclosporiasis have been linked to various types of imported fresh produce. People living or traveling in countries where cyclosporiasis is endemic may be at increased risk for infection. What are the symptoms of Cyclospora infection? The time between becoming infected and becoming sick is usually about 1 week. Some people who are infected with Cyclospora do not have any symptoms. How long can the symptoms last? If not treated, the illness may last from a few days to a month or longer. Symptoms may seem to go away and then return one or more times (relapse). It’s common to feel very tired. If you think you’ve been infected with Cyclospora see your health care provider. Your health care provider will ask you to submit stool specimens to see if you are infected. You might be asked to submit more than one specimen from different days. Identification of this parasite in stool requires special laboratory tests that are not routinely done. Therefore, if indicated, your health care provider should specifically request testing for Cyclospora. In addition, your health care provider might have your stool checked for other organisms that can cause similar symptoms. The recommended treatment is a combination of two antibiotics, trimethoprim-sulfamethoxazole, also known as Bactrim*, Septra*, or Cotrim*. People who have diarrhea should also rest and drink plenty of fluids. If a person ill with cyclosporiasis is not treated, symptoms can persist for several weeks to a month or more. Some symptoms, such as diarrhea, can return; and some symptoms, such as muscle aches and fatigue, may continue after the gastrointestinal symptoms have gone away. The infection usually is not life threatening. I am allergic to sulfa drugs; is there another drug I can take? No highly effective alternative drugs have been identified yet for people with Cyclospora infection who are unable to take sulfa drugs. See your health care provider to discuss potential options. 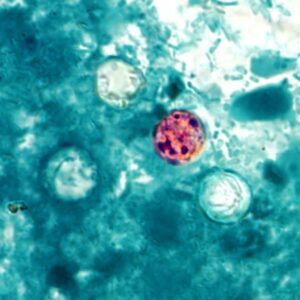 Avoiding food or water that might have been contaminated with stool may help prevent Cyclospora infection. People who have previously been infected with Cyclospora can become infected again. In the United States, foodborne outbreaks of cyclosporiasis since the mid-1990s have been linked to various types of imported fresh produce, including raspberries, basil, snow peas, and mesclun lettuce; no commercially frozen or canned produce has been implicated. On the basis of the currently available information, avoiding food or water that may have been contaminated with feces is the best way to prevent cyclosporiasis. Treatment with chlorine or iodine is unlikely to kill Cyclospora oocysts. No vaccine for cyclosporiasis is available. CDC monitors the occurrence of cyclosporiasis in the United States and helps state health departments identify and investigate cyclosporiasis outbreaks to prevent additional cases of illness.